It’s been thirty years last year from the moment when Accuphase presented to the world their own Compact Disc Player. 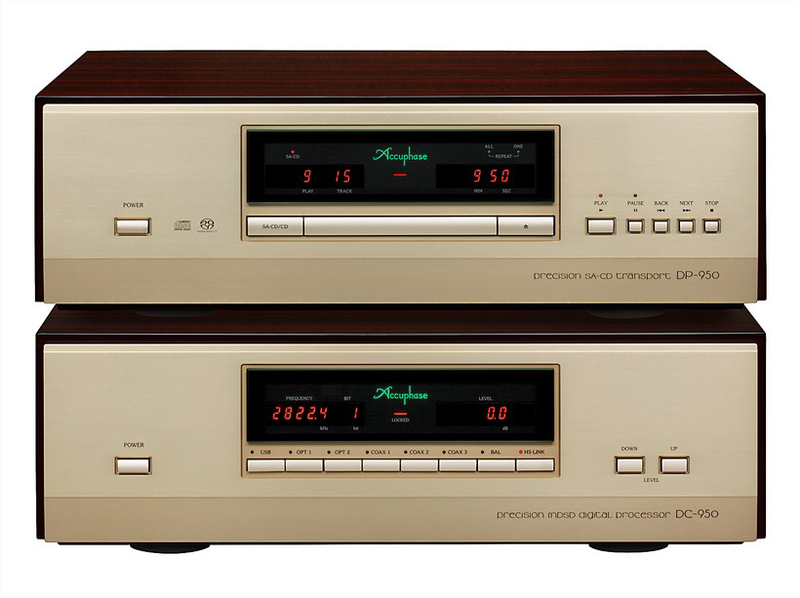 The two-box DP-80/DC-81 system premiered in July 1986 and immediately became a flagship player for this brand. The CD transport was designed in a way it would have been today, ie. with utmost attention to the power supply circuit and knowledge of the impact of vibration on sound. Equally important was its physical construction – DP-80 weighed 15 kg, which is more than most integrated players made at the time. The digital-to-analog converter DC-81 or a Precision Digital Processor as the manufacturer called it (and keeps calling it products so also today) was an equally advanced design. Accuphase, perhaps as one of the first manufacturers ever applied several DAC chips working in parallel, thereby reducing conversion errors, and thus noise. The power supply section was equally carefully designed – already this, very first product of its kind, incorporated two separate transformers, one for the digital and one for the analog section. During those thirty years the world has changed beyond recognition. Although seemingly everything is as it was before, ie. the latest version of the company’s flagship player, DP/ DC-950 features a separate transport and D/A Converter, the passing of time for Accuphase is marked with support for the Super Audio CD format strongly supported by the brand regardless of popular market’s trends. 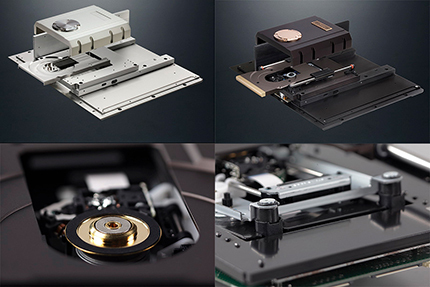 Therefore, DP-950 is a SACD transport, built around a mechanism that Accuphase have been fine-tuning since 2006, i.e. since the premiere of the first player of this type in its catalog, the DP-800/DC-801 system. The latter featured transport mechanism based directly on the transport of the Sony SCD-1 player. There are only few elements inherited from it by the DP-950 – an optical system and a few other components. The rest is completely changed and looks, in short, fantastic. Now it is an extremely sturdy, rigid mechanism, that by its complexity reminded me the Esoteric VRDS-NEO Esoteric transports. The DSD signal of SACD discs for many years was “closed” to external companies and it could not be sent of a SACD transport out. Accuphase, however, received a “blessing” from Sony and prepared its own coded transmission system, a modified version of HS-LINK (based on RJ-45 socket, i.e. Ethernet one). The system under review features it’s the latest version, v.2. It allows transmission of the DSD128 (5.6448 MHz) and PCM up to 32 bits and 384 kHz (formerly, respectively DSD64 and PCM 24/192) signals. The DC-950 DAC features a corresponding input. Its fit&finish are simply exceptional – it is made the way every high-end product should be. The transport mechanism operates silently, the buttons work reliably and have a clear action point. The enclosure is made of several layers, and on top they put a “case” finished with high gloss veneer. DP-950 weighs 30 kg and it should be handled by two people. It plays CD, CD-R/RW, SACD discs and DSD files in DSF format. There is one thing it misses – it’s the first Accuphase transport that does not read the text of this type of discs nor the CD-TEXT. The DC-81 converter features four, working in parallel, 16-bit DAC chips per channel. This solution is called Multi Delta-Sigma (MDS) and its latest version is called MDS ++. In this particular case, manufacturer used eight-channel ES9038PRO chips from ESS Technology, one per channel with their output combined in parallel – therefore each channel features eight, working in parallel, D/A converters. As I said, the SACD format is as important for Accuphase as the CD. For a long time, the company has been developing their own, unique way to decode it without usage of additional filters. This system is called Multiple Double Speed DSD (MDSD). It takes advantage of the presence of eight converters in every ESS chip. After volume processing, the timing of the 1-bit signal is shifted progressively in increments of 177 nanoseconds (about 5,600,000th of a second), using high-performance circuitry. The resulting delayed signals are sent to multiple D/A converters for conversion into analog form. The converter outputs are then summed. Signal components with precipitous changes, i.e. high frequencies are sequentially averaged, so that the entire circuit acts as a high-cut filter that removes unwanted noise components in the high frequency range. Because the MDSD can directly decode the 1-bit signal, it does not add spurious noise like a conventional digital filter does. DC-950 is built as solidly as the transport. It sports, obviously, a gold front panel, a double casing, and the power supply is based on two large toroidal transformers – that’s a classic dual-mono system. Manufacturer treated analogue outputs also very seriously. The RCA and XLR ones feature separate systems (filters + buffers), so they operate largely independently. As for the functionality this converter offers almost everything one could wish for: three RCA inputs (24/192), two TOSLinks (24/96), AES/EBU (24/192), USB (DSD, PCM 32/384) and HS-LINK (DSD128, PCM 32/384). There are also two digital outputs, just in case – RCA and TOSLink. There are two analog outputs per channel – XLR and RCA. XLR is equipped with a switch changing its absolute phase. In the neutral position XLR is wired in the old way, ie. with “hot” pin No. 3. I know the sound of almost all two-box Accuphase players, starting from the DP90/DC-91. Every time a successor to the older series was introduced, we received something else, as if we were looking at replayed material from a different perspective. When I hear something like that, ie. a correction of the sound in successive generations of products from other manufacturers, I’m 99% sure that someone sat down and through changes in the circuit, selection of components, and tuning of the performance he tried to achieve a certain sound signature based on a certain set of features. But it is different when it comes to Accuphase products. It’s obvious that the people working there love to listen to the music and always target the best possible sound. Mr. Jim Saito, who joined the company in the 1980s in order to prepare it for a digital era, who is responsible for all of its existing Accuphase players, is privately a progressive rock fan. We sometimes exchange albums from our collections and I must say that he has excellent taste. Despite this Accuphase works differently than most small, specialized companies. First of all – they do not “tune” their products, i.e. they don’t replace elements, components, circuits in order to achieve targeted sound. Saito-san approaches this task as a true engineer, ie. he undertakes technical goals, such as: less distortion, lower noise, improved thermal stability etc., and in successive generations of products he applies better and better technical solutions, assuming that these translate into the improvement of sound quality. And they indeed do, but at the same time every time the sound is a bit different. So one can, as in the lab, see what particular technical innovations and improvements change in the performance of a given type of equipment, regardless of which company they come from. Here nothing is affected by the subjective choices. The latest Accuphase SACD Player is, above all, more resolved than the ‘900/901’ system. And at the time it seemed that it would be almost impossible to further improve this aspect considering the huge advantage of the ‘900/901’ over its predecessor, the ‘800/801’ model. The new player at the same time delivers very soft, natural sound – similar to what we hear while listening to the live music. But this is not quite “tube-ish” sound, ie. warmed up or round – it’s definitely nothing like that. The resolution of which I speak, translates to plenty of information that with other players, like my trusted AIR V-edition Player, are delivered somewhere in the background, but play a very little role in the overall presentation. I’m talking about information on reverbs, density, sound plans. Which, in the context of Ancient Audio Player, which served as the reference, was very interesting because so far it’s always was a real champion in this regard, very difficult to top. The Accuphase did it effortlessly. And in general the sound of this Player can be characterized very well with this single word: “effortless”. Despite the fact it doesn’t mask nor hide anything. I would even say that it is always trying to show something more. The cymbals are with it at the same time strong, vibrant, they also have an excellent depth and very nice acoustic ambiance around them. They are not one-dimensional and their sound does not come from just one point of the space. They have had a kind of “air-cushion” that separates them from other instruments – both in space and in tone. Better yet, you can hear it on the bass. I had a pleasure of reviewing only one other Player that differentiated this part of the range equally well, that focused the sound so well without contouring – it was the Metronome Technologie Kalista system. The Accuphase is really good at filling up the sound, never allowing him to break away from the ground. 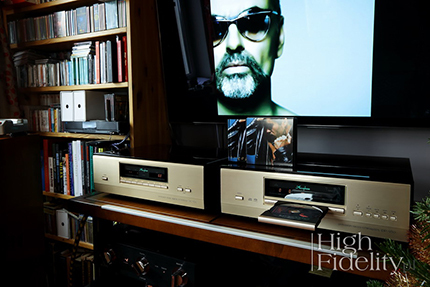 Even if the center of gravity/tonal balance on the disc is shifted upwards – like, for example, on Peter Gabriel’s So (the SACD version) and on Pet Shop Boys’ Super the Accuphase never forgets about the lower part of the range. We are dealing here with a combination of highly credible attack and a natural softness, fidelity and naturalness. The sound of the following discs has its own characteristics, resulting from the recording and the particular release, but every time we get proper richness, softness and throbbing, rich bass. The latter is the more interesting, that it is not – hallelujah! – additionally emphasized. Striving for the best, most precise definition usually ends with a rugged, obtrusive and unequivocal sound. And the music should never be unequivocal. And just this “multi-dimensionality” is what I appreciated most in this device. Disc after disc, and each of them was different. T.LOVE – dark, tonal balance shifted down, Can Dance Into The Labyrinth – nicely developed, with beautifully marked treble, velvety Nat ‘King’ Cole, etc., etc. Every time I heard something new, different, inherent to the particular disc. What was emphasized by extremely extensive space. ‘950’ shows us the events without imposing their presence. It is a “laid back” presentation, ie. with the front of the stage slightly retracted – although this particular element depends on the type of input and links (I’ll get back to that). The soundstage is very wide and extremely deep. The elements in the front of the soundstage, even if these are large, rich vocals like Sinatra’s, are shown a little further away from the listener, behind the line connecting the speakers. So this is the exact opposite of what I heard from the Ayon Audio CD-35. This is a device, which – if something slipped sound engineers out of control – does not smooth out the treble, does not cover it up so that the sound was more “pleasant” to listen to. And yet, it never came to a moment that would force me to say “enough” because of too much emphasis on a upper midrange, or too metallic cymbals. But this is one of the intrinsic characteristics of this source – the well differentiated and extended highs are powerful, clear. Depending on the system it will be an advantage or something that one will need to correct using other elements of the system. Note that the midrange is not as creamy and so dense as provided by the said Ayon, because Accuphase set priorities differently. But the bass presentation is unrivaled, no matter what is our vision of the absolute sound. So far I did not mention which medium is a preferred on for DP/DC-950 and I did it for a purpose. What I described so far concerns both, CD and SACD, but… This is the second case when I was truly fascinated with the latter. The SACD format, which promised so much, has never really seduced me. Even the best players in my ears did not present any special advantage of SACD format over the CD. Ayon CD-35 was the first device that changed my mind about it, and the performance Accuphase left me fascinated with the sound of SACD. The Super Audio CDs played with it had better depth, the plans and images very differentiated in a much better way, and above all they were even more dynamic. Music seemed much clearer, but not by emphasizing the treble or attack, but by the fact that there was more information in the sound. Softness, what is an intrinsic feature of this format, in conjunction with the Accuphase’s character created a unique blend of velvetiness and bluntness. Plus there was this fantastic bass – finally I heard something, that I heard in the best recording studios – the definition and shape. HS-LINK is a digital link, characterized by a high bit rate, developed by Accuphase with a sole purpose in mind: the transmission of the encoded DSD signal. I’ve heard all its incarnations, and I always thought that sound from CD was better if the signal was transmitted using the classic, technically inferior connection – coaxial S/PDIF. I think that the special performance the designers achieved with this source can be largely credited to the new version of the HS-LINK. The was the first time I preferred this connection also with CDs. They sounded way better via HS-LINK. The sound transmitted via HS-LINK opens. When switching to RCA cable one simply gets less information. The presentation starts to focus listener’s attention on what is happening in the foreground. There is a little less treble, but again it is caused by the fact that the sound is described by fewer components, and not because of any tonal shift. With RCA cable the foreground is presented closer to the listener and slightly emphasized, which may seem at first more attractive. But after a while one realizes that it is a poorer presentation, deprived of the “flow”. Hence, this time I used HS-LINK for both types of the discs. It is possible to describe the sonic signature of the Accuphase, mainly talking about the tonality and size of the instruments. It is an open and dynamic presentation that does not contain as saturated and emphasized midrange as provided by Ayon CD-35 or Metronome Technologie Kalista system. The treble here is strong and clear, although the leading edge is not accentuated enough to cause loosing this beautiful velvety character. The bass is always powerful, rich, present and well differentiated. The first plan is rather set back behind the line connecting loudspeakers and the presentation is rendered far down, layer by layer. 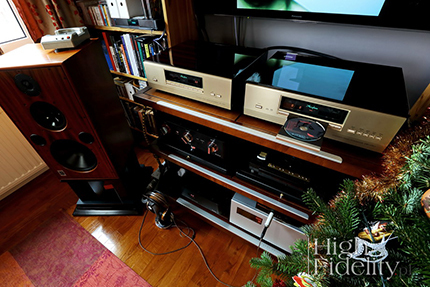 The sound of DP/DC-950 Player will appeal to those who appreciate neutrality and high fidelity. But there is also the naturalness, which added to the above mentioned two gives a unique mix. The Accuphase plays both faithfully and modifies the presentation in a way that I just described – yet another unusual combination. Because this is a source, which is able to interest us with both, a new album and one that we have listened to hundreds of times. And, perhaps most importantly, finally, the SACD format has gained a strong representative. The Accuphase company has been its supporter for years, but for the first time they managed to convince even me, the Zealot of the Compact Disc world. The DP/DC-950 is a shared symbol of the two-box Accuphase Super Audio CD Player; DC-950 stands for the DAC, and DP-950 for the Super Audio CD (and CD) transport. Both components of the system feature the same housings. They were built with several layers of sheet metal and placed inside an additional enclosure finished with high gloss wood veneer. The latter resembles enclosures of 1960s and 1970s Marantz and McIntosh devices. The front panels are anodized for a gold color. In the middle there are the glass plates covering LED displays and red LEDs. Below one finds push buttons, and in the transport instead of buttons there is a transport drawer. And this is quite a special transport. It’s been developed by Accuphase for years, and with its sturdiness and precision of its make it reminded me of the best SACD transport, I know, ie. VRDS-NEO by Esoteric (TEAC). The whole mechanism is fixed to a thick aluminum plate with reinforcements on both sides. Trolley with optics is separated from the whole design with four rubber suspensions. Also, the drawer is milled from aluminum and closes in a wonderfully quiet but efficient manner. Reading the signal is controlled by a digital servo system with a dedicated DSP. There are two digital outputs – HS-LINK (SACD and CD) and RCA (CD only). Inside, behind the transport, there are two shielded toroidal power transformers. At the side there is a bank of voltage filtering capacitors, and power supplies. On the other side one finds output circuits including the DSP which encodes DSD signal for the HS-LINK. The DC-950 is a digital-to-analogue converter, called by the manufacturer the Precision MDSD Digital Processor. It features eight digital inputs, including 2 optical, 3 RCAs, AES/EBU, USB and HS-LINK. The sampling frequency of the decoded signal and its bitrate are presented on the orange LED display. The second display presents the output signal level in dB – the converter features an adjustable output level ranging from -80 dB. This adjustment is performed in the digital domain and in an optimal configuration the device should work with an external preamplifier. The key components are two, eight channel DAC chips – ESS Technology ES9038PRO, one per channel. Eight internal converters are connected in parallel at the output, for a lower distortion. The same system is used also to decode DSD. This technique, called by Accuphase the MDSD (Multiple Double Speed DSD), allows for direct conversion of the DSD signal to analog. First, the signal is upsampled from 2.8224 MHz/1 bit to 5.6448 MHz/1 bit form, and then delayed using special sequence inside programmable, ultra fast FPGA (Field Programmable Gate Array), and finally decoded in the D/A Converters. Summing up all the sections results in kind of a low-pass filter – one can find it in every SACD player, but it was never designed in such a perfect and puristic way. A characteristic feature of the MDSD process is the use of the MDS system, that allows reduction of conversion errors to an absolute minimum. The MDSD thereby acts as a natural highpass linear-phase filter. Both devices look absolutely stunning. One control them using a remote control that reminded me of those used in the 1980s. It features hard, convenient buttons of different shapes and colors, which helps to operate the player.